So it took way longer than expected to come to this point. I was having trouble trying to get the fire button to not fire when it hit the enemy. All that other stuff, enemy adding, noise adding, was fairly easy but this took at least a few hours and many reattempts. But I finally got it working. 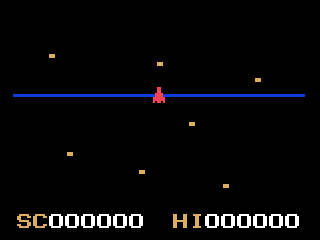 Odyssey 2 coding is like trying to put together a jigsaw puzzle, because of the small sections. And the only way to jump from section to section is with the "jmp" command. And if some code spills into another section, even though it may compile, it won't work. But that wasn't the problem I was having this time. The computer chose to simply ignore a line or two of code. So I had to keep trying to make it not do that.